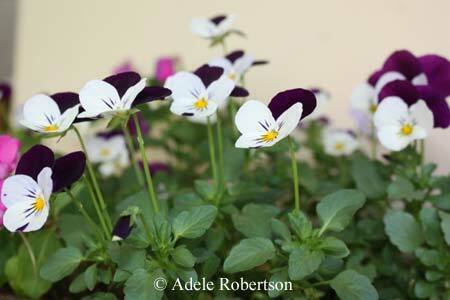 Some useful flower gardening advice and tips surround organic matter and compost. Let's talk a little bit about organic matter. Organic matter is made up of the remains of living things, animals and plants, which decompose and return to the soil, giving up their nutrients and vitamins. A good amount of organic matter in the soil makes it fertile and nutrient-rich, a great medium for plants. If your soil doesn't have much organic matter, not to worry, you can always add compost or manure to "amend" the soil (some good flower gardening advice here is not to add too much compost; too much of a good thing can be bad). Compost is the partially decayed remains of plants and animals and is an excellent source of organic matter; what's more, you can make it yourself and keep it handy for all your gardening needs. It's relatively easy to make your own compost pile and it will help save you money and trips to your local gardening supply store if you have a ready supply of organic matter. Compost provides nutrients and enriches soil; as an amendment to soils rich in clay, compost helps drainage, while as an amendent to soils rich in sand, compost helps hold more moisture. Also, by maintaining a compost pile, you are helping out the environment by decreasing the amount of material piling up in landfills. Some of the best flower gardening advice I received was to start a compost pile; get a six inch layer of chopped leaves, grass clippings and waste from your kitchen like banana peels, lettuce leaves, coffee grounds or tea leaves (don't use bones or meat), and you can also use shredded branches, garden plants whose time has come (make sure they're not diseased), shredded paper, weeds (make sure they haven't gone to seed), straw or hay, or newspaper. Cover this layer with three to six inches of soil, manure, or finished compost. Alternate layers of organic matter and soil/manure to reach a pile about three feet tall; the heat generated by this pile will function to sterilize your compost and you will be able to use it for potting soil, mulch, or as a soil amendment. Keep the pile in an area that is shady and sprinkle it with water when it seems dry; keep it moist (but avoid it being soggy). Turn the pile to circulate oxygen. When it's ready (usually when there's no heat), you can mix it with soil before planting your flowers or use it as mulch; but use it quickly or the nutrients will dissipate. Make sure the stuff you put in the pile is small, either use a shredder or run your lawn mover over them.